Hut Frisk in Marsaskala (Fresh Fish) | Simple. Tasty. Good. One Wednesday morning, 6:45 am. We got up early to go on a special mission. 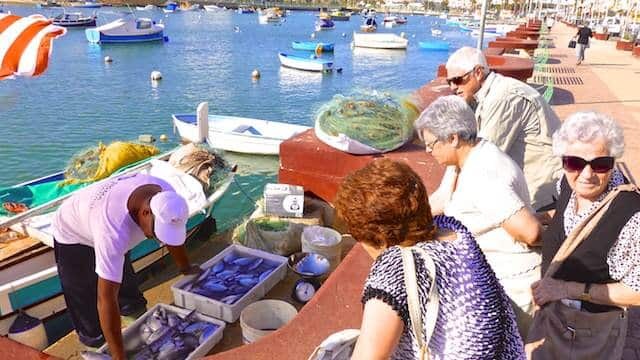 Rumor had it there was fresh fish to buy in the Marsaskala harbor at daybreak. Well, at least according to the bigilla vendors who pass our street every Tuesday evening. So we though we might give it a shot. We walked down to the harbor to Salini Street (Triq Is-Salini) and were a little disappointed to see pretty much nobody: no fishermen, no fish vendors and no fish at all. But we wouldn’t give up that easily. Walked around the harbor towards Marina Street (Triq Ix-Xatt), enjoying the peaceful panorama with the picturesque boats at such an early hour. If our fish mission failed, we would at least have made a refreshing morning walk. We might even pick up a good espresso somewhere? What a beautiful start of a day, no? We could see that our favorite fruits & veg stall at the roundabout a little further towards Zonqor Road (Triq Iz-Zonqor) was already in full operation offering colorful and tasty local produce for a fair price. But apart from that our most hungry eye spotted yet another much smaller open white van hidden behind it with a handful of people flocked around it. Now that’s a good sign right there! Guess we might be lucky today… And yep indeed, as soon as we got closer and I saw those sea bream tails peaking out of a styrofoam box, I declared our fish mission: extremely accomplished! So the bigilla vendors we talked to the other day was absolutely right. We also gathered around and patiently awaited our turn to order. This gave us ample time to inspect the goodies in front of us. The choice of fish was limited but visibly of a superb quality: slimy fish with glossy eyes. That’s what we’re looking for! 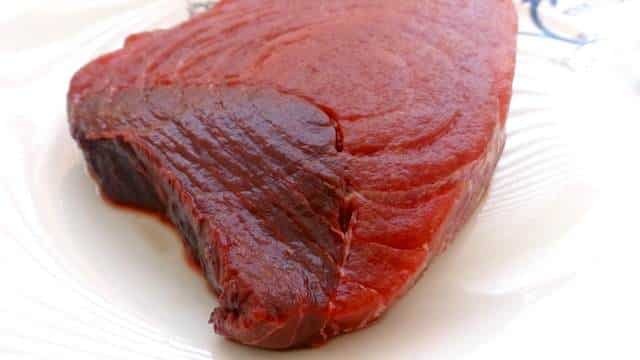 On sale: ray, sea bream, yellow snapper, squid and the most magnificent tuna steak I’ve ever seen. The zealous fishmonger lady told us she is at the Marsaskala harbor the moment the fishermen come back from their nightly fishing trip. Then she selects the freshly caught fish herself which end up in the back of her fish van. Watch out: she’s doing this on Wednesday and Friday morning only! And if you want to have the best choice of fish, be there between 6:30 am and 7:30 am. 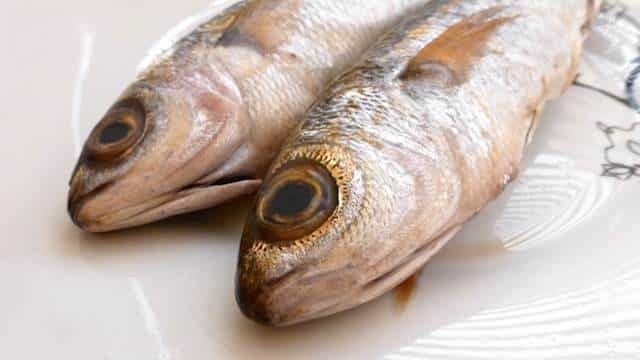 So once it was our turn to choose, we laid our hands on a couple of fatty yellow snappers, paying €3 for the lot. 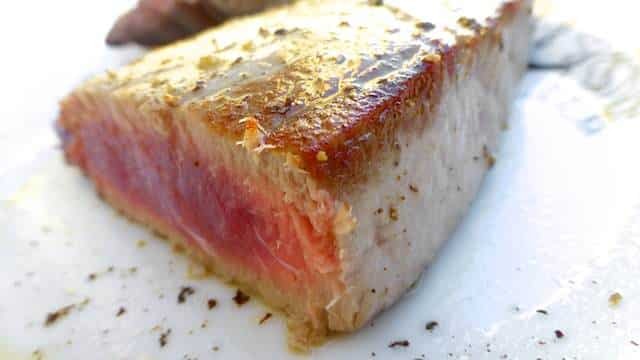 We were about to call it a day but our eyes kept going back to that superb 1-inch thick slab of dark red tuna steak. How much a kilo? €15, she says. We didn’t even consider it or blink and the tuna was bagged and put on the scale: €6, she says. I can honestly tell you we easily pay double this price in our hometown for tuna that doesn’t even look half as fresh as this one. So off we went with our prize possessions! Just stopped at our fruits and veg vendor next door to pick up some new potatoes, cauliflower and juicy strawberries. Job well done. Let’s bring the goodies home straight away, coffee’s on the house! A week later we went back to this lady to find us some fish. 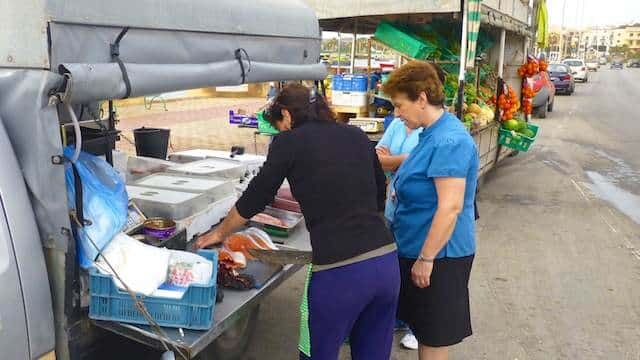 The ray looked stunning but we had bought some excellent ray in Marsaxlokk last Sunday so we decided on 2 beautiful sea breams, 1 lb (450 g) each and paid €6,50. While walking back home we spotted 2 other fishermen who weren’t there last time selling some of their catch straight from their boats. 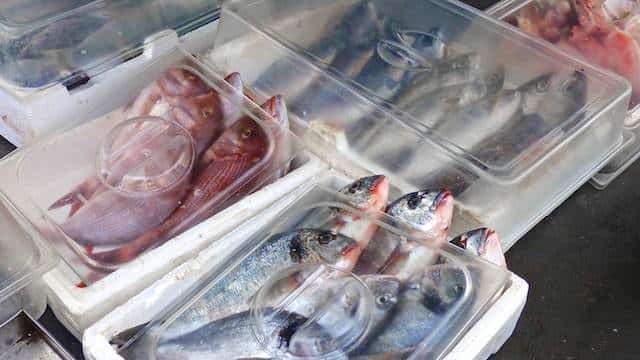 I saw fresh squid, little sea breams, a mix of smaller fish such as scorpion fish (good for fish soups), a barracuda, fresh clams and moray eels. I have the impression the bigger whoppers go straight to the restaurants in the neighborhood and the fishermen still try to earn a few bucks more by selling off the smaller buggers while cleaning their boats. Something to remember next time!